It’s with great pleasure that we dedicate this edition of the Top Misused Words to Webster and to all who are passionate about language. assume – to suppose to be the case, without proof; to take or begin to have (power or responsibility). Incorrect: I’m not 100% sure, but I would presume a “Toad in the Hole” is an amphibian in the ground. Correct: I’m not 100% sure, but I would assume a “Toad in the Hole” is an amphibian in the ground. presume – to suppose something is the case on the basis of probability; to be audacious enough to do something. Incorrect: Judging from the recipe – a dish of sausages in Yorkshire pudding batter – I would assume “Toad in the Hole” is delicious! Correct: Judging from the recipe – a dish of sausages in Yorkshire pudding batter – I would presume “Toad in the Hole” is delicious! decimate – kill, destroy, or remove a large percentage or part of (original meaning limited to kill one person in ten). Incorrect: Julius Caesar threatened to devastate the 9th Legion during the war against Pompey. Correct: Julius Caesar threatened to decimate the 9th Legion during the war against Pompey. devastate – destroy or ruin (something). Incorrect: The city was decimated by a huge earthquake. Correct: The city was devastated by a huge earthquake. ensure – make certain that (something) shall occur or be the case. Incorrect: Encourage passengers to wear seatbelts to insure their safety. Correct: Encourage passengers to wear seatbelts to ensure their safety. insure – arrange for compensation in the event of damage to or loss of (property), or injury to or the death of (someone), in exchange for regular advance payments. Incorrect: If you don’t live in an earthquake zone, should you really ensure your home with an earthquake policy? Correct: If you don’t live in an earthquake zone, should you really insure your home with an earthquake policy? farther – used as comparative of far; more distant in space than another item of the same kind. Incorrect: On the further side of the mountain, you’ll find treasure. Correct: On the farther side of the mountain, you’ll find treasure. further – to a greater degree or extent; help the progress or development of (something); promote. Incorrect: She had depended on articles to farther her exposure as an Expert Author. Correct: She had depended on articles to further her exposure as an Expert Author. literally – in a literal manner or sense; exactly. Incorrect: I can’t believe you figuratively ate an entire half gallon of ice cream in one sitting! Correct: I can’t believe you literally ate an entire half gallon of ice cream in one sitting! figuratively – in a figurative sense; metaphorical. Incorrect: The Haunted House was so scary: I literally died of fright! Correct: The Haunted House was so scary: I figuratively died of fright! Proofread. Maintain your credibility. Avoid confusion. Gain readers. It’s that easy! Do you have any misused words you’d like to see added to the Top Misused Words series? Share them in the comments section below – we’d love to hear from you! For more posts like this, check out the Top Misused Words category! * This post was updated on October 16, 2013 at 4:15 p.m. CST. 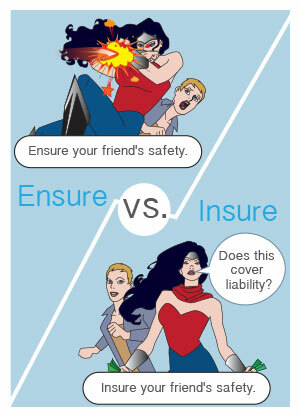 COOL, I almost never thought of the difference between ensure and insure. I will be watching out for the two words from now onwards. The Assume/Presume illustrations very interesting. On this basis, seems that Stanley’s famous greeting to Livingstone – “Dr Livingstone, I presume” – is spot-on ! Webster wasn’#t a pleasant man, and his ideas of ‘standardization were highly idiosyncratic; yet like Dewey, Wilde and some others, he did a great service to the language. He is rightly lauded, even on the UK side of the Pond! We may have lost the fight for ‘literally’. The abuse of this word has become so extensive that using it in its proper sense – as above – can lead to confusion. I’m tending now to find another expression to express the thought (which isn’t easy!) to avoid seeming just to use trite emphasis. Troubleshooter is another word frequently misused to mean the Trouble maker. Really interesting to remind ourselves about theses set of words. They all struck me right where needed. In my vocabulary! For sure, I’ve used all of these incorrectly at one time or another. How about toward and towards, regards and regard? I see these words misused all the time. Sorry, but that was not 255 years ago. Either it was 185 or you got the year wrong. Just posted in the interests of accuracy. I was thrown by the dates and time of 255 year period also. How ever all the necessary information was in the article. Webster published the dictionary when he was 70 in 1828 but he was born in 1758. The 255 refers to years after his birth not years after the publication. You’re exactly right! You’ll note that we updated the post accordingly. Different spelling – but identical meaning and each is absolutely acceptable and correct when used within the right context. Perhaps one of the two spelling variants is more favoured – or favored ! – in different parts of the world. Here in the UK, all but pedants regard these as identical. There does seem to be a preference for one or the other in different contexts, but I’ve never found a pattern to this, and never spoken to a British expert who would affirm that substituting one for the other was wrong. So helpful for any writer whose English is not his native language. 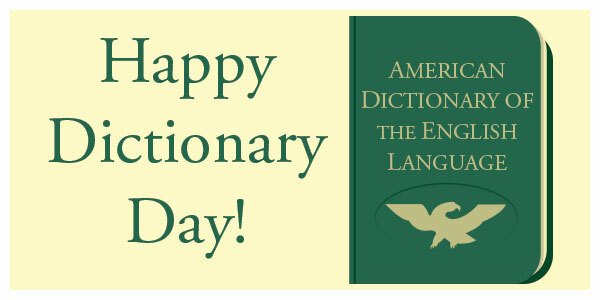 I never knew there was anything like a dictionary day, thanks for this information. a very useful information. Some confusing words have been working good. Happy Dectionary Day Penny, I am very happy to read this post. very useful article, the difference between Assume vs. Presume and topic is very good and interesting. Roger, it used to, but now I accept that it’s becoming common currency and I regard it as OK (another expression now accepted) when used grammatically. I don’t use it myself, though. ‘For free’ does, after all, make logical sense, following similar usages; more than a lot of long-accepted expressions which had their origins in usages which have now died, leaving the expression as a historic relic. Of course, pedants love these illogical relics, while denigrating any neologism, whatever its sense. They’d have hated living alongside Shakspere! I always get this confused. When i see “Ensure”, i think about the nutritional drink lol. But i believe “Ensure” means to guarantee….?!? ‘Insure’ is to arrange to get compensation if it doesn’t! ‘Swam’ and ‘shrank’ have pretty much died. There was a grammar school reading book titled ‘If I Were Going.’ The conditional tense has died. The few who say, and even who write ‘if I were’ are designated purists. Both of these are examples of how the English language is changing, Emily. 1500 years ago, English was one of the world’s more complex languages, with dozens of tenses and a strong preference for modifying sounds within the word to indicate tense, gender, belonging and number. ‘Swam’ and ‘swum were not at all the same meaning, and ‘were’ and ‘was’ certainly not! But gradually, English has simplified and modification by prefix and suffix and additional words has come to dominate today. The problem is that there is a huge number of ‘relict’ uses which belong to past methods of word modification, where the rest of the set has vanished. I suppose that we have to accept this in a living language which isn’t (like French) governed by fiat. It’s hard for new users, though! They’re (short for “they are”)! Thanks for the clarification. I honestly can say I did not know the exact definition of some of these terms. Robert, those pretentious uses are more irritating than normal infractions, aren’t they? Mmm. I also get the urge to give a cutting answer that the offender, hopefully, doesn’t get but everyone else does. But there are two problems: first, I always come up with the reply long afer the moment has passed; and second, if it was an honest try to be correct, I don’t want to offend but to correct – and that’s a can o’ worms itself! Putting the sentiment into a sardonic remark – something along the lines of ‘Oh, I see. Do you really feel you are that way? Maybe you should look it up.’ That passes, whichever category the offending remark fits into. Noah Webster and to all who are passionate about language are grate gifts. And if at the age of 70 years, he came up with a Dictionary, it means and shows that old age does not bare one from learning. Today, after about 185 years of this very great development, Dictionary still waxes good and fine. The Authority that declares the day:HAPPY DICTIONARY DAY,should extend the good gesture to become:HAPPY DICTIONARY MONTH, if only applicable to: AUTHORS, STUDENTS and TEACHERS,who use DICTIONARY than any other segments. Once more, happy Dictionary Day. I read the story about Noah Webster with my kids when they were young. It took him decades (I forget how many) to put the dictionary together. I agree that he should get a month, not just a day, to be remembered for the gift of the dictionary he gave to us.